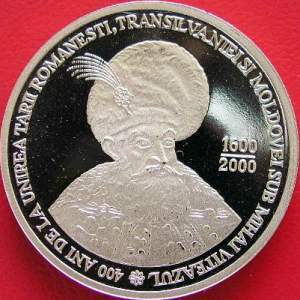 Obverse: ROMANIA, Romanian coat of arms, year 2000, face value 2000 LEI and a Walachian cavalryman Reverse: bust of voivod Michael the Brave, at left years 1600 and 2000 (written as a fraction), inscription "400 ANI DE LA UNIREA TARII ROMANESTI, TRANSILVANIEI SI MOLDOVEI SUB MIHAI VITEAZUL " meaning "400 YEARS SINCE THE UNION OF WALACHIA, TRANSYLVANIA AND MOLDAVIA UNDER MICHAEL THE BRAVE"
Reverse: bust of voivod Michael the Brave (another variant), at right years 1600 and 2000 (written as a fraction), inscription "400 ANI DE LA UNIREA TARII ROMANESTI, TRANSILVANIEI SI MOLDOVEI SUB MIHAI VITEAZUL " meaning "400 YEARS SINCE THE UNION OF WALACHIA, TRANSYLVANIA AND MOLDAVIA UNDER MICHAEL THE BRAVE"
The cavalryman design seems to be inspired by an engraving from the volume Diversarum gentium armatura equestris (Arming Manner of the Various Peoples' Cavalrymen), printed at Amsterdam in 1601 - book contemporary with Michael the Brave. 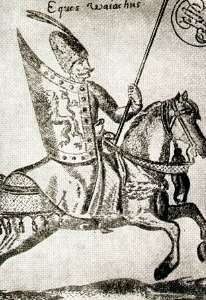 The engraving, representing a Walachian cavalryman, was used by the renown Romanian historian Dinu C. Giurescu to illustrate his book "Istoria ilustrată a românilor" (Illustrate History of the Romanians), Bucharest, 1981. This pattern was not approved for the final official issue. The approved variant has another design, 5000 de lei face value and is made in gold. It is easy to see that this pattern design is not very elaborate: the lance (in the engraving, held by the cavalryman in the left hand, replaced in the pattern by a bugle) appears only as a lost segment at the back of the soldier. The pattern pictures above are present on Romanian coins through the kind permission of Mr. Florin L..